Melvyn Bragg discusses asteroids, once regarded as “the vermin of the solar system” but now viewed as key to our understanding of the beginning of time. 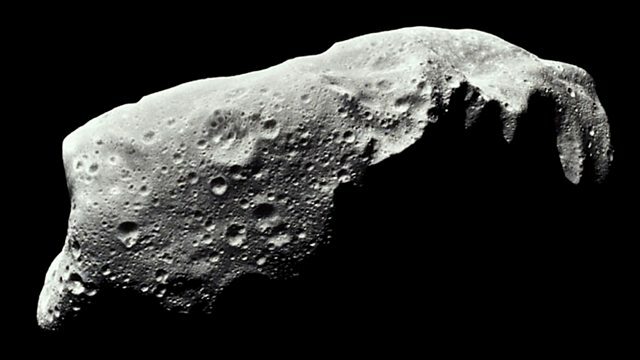 Melvyn Bragg and guests discuss the unique properties of asteroids. They used to be regarded as the 'vermin of the solar system', irritating rubble that got in the way of astronomers trying to study more interesting phenomena. It was difficult or even impossible for an observer of asteroids to book time using the world's best telescopes, because they were regarded as unspectacular objects that could tell us little about the origins of the universe. However, that has all changed. It is now thought that asteroids are the unused building blocks of planets, 'pristine material' that has remained chemically unchanged since the creation of the solar system; a snapshot of matter at the beginning of time. At the moment the Japanese probe Hayabusa is 180 million miles away, pinned to the back of the asteroid Itokawa, attempting to gain our first samples of the chemical composition of an asteroid. Why did asteroids fail to form planets? How do they differ from their celestial cousins, the comets? And are either of them likely to create another impact on planet Earth? With Monica Grady, Professor of Planetary and Space Sciences, Open University; Carolin Crawford, Royal Society Research Fellow, University of Cambridge; John Zarnecki, Professor of Space Science, Open University.